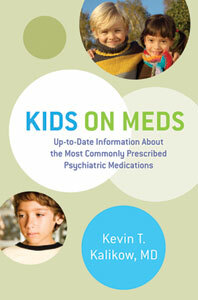 A popular guide for consumers about all the psychiatric drugs used with kids. Arguments abound about whether psychiatric medicines are over- or underprescribed, even as their use in childhood and adolescence has become commonplace. Knowing how various medicines work, their side effects and doses, will help parents understand their child's experience. And if you are considering medication for your child, the crucial question is, could it help? This book is an overview of the four groups of medicines most commonly used in child and adolescent psychiatry—for ADHD, depression and anxiety, psychosis, and mood disorders. It discusses not only the drugs but also how they work in the body, as well as the culture of today's medical practice. Kevin T. Kalikow offers measured advice on how to evaluate and treat young people with medicine and how to decide if medicine isn't the right course of action. It is essential reading for anyone who needs to wade through the complicated—and often contradictory—medical information about kids and drugs.